Begun whilst the artist was at Bellshill Academy in Glasgow, this is one of James Cowie's most successful compositions. It has many preparatory drawings associated to it, revealing Cowie's painstaking method of picture making. Unlike art teachers today, Cowie used his classroom as his studio and would work alongside his pupils, rather than teaching them, observing them closely whilst he did this. He was fascinated with them in much the same way as the children of Townhead in Glasgow were later to fascinate his pupil Joan Eardley. 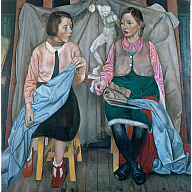 However, unlike Eardley Cowie's children aren't full of liveliness and rough humour but are dreamlike and idealised. Here we see Mary Colvin on the left of the painting and Nulece Cassells who was a year younger, on the right. Nulece, whose parents were Lithuanian, Anglicised her name to Nancy and later became a doctor. Purchased in 1937 with income from the Webster Bequest.